Josh Peckler - Jpeckler@shawmedia.com Samantha Leicht watches her put during the McHenry County Junior Golf Association's Billy Vahldieck McHenry County Junior Amateur tournament at Boone Creek Golf Club in Bull Valley Tuesday, July 10, 2012. Josh Peckler - Jpeckler@shawmedia.com Emily Johnson of McHenry reacts to a bad put during the McHenry County Junior Golf Association's Billy Vahldieck McHenry County Junior Amateur tournament at Boone Creek Golf Club in Bull Valley Tuesday, July 10, 2012. 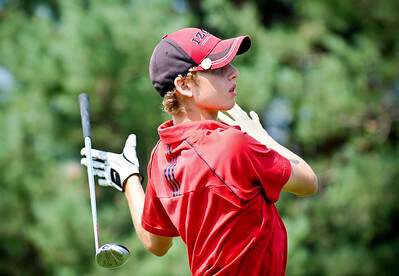 Josh Peckler - Jpeckler@shawmedia.com during the McHenry County Junior Golf Association's Billy Vahldieck McHenry County Junior Amateur tournament at Boone Creek Golf Club in Bull Valley Tuesday, July 10, 2012. 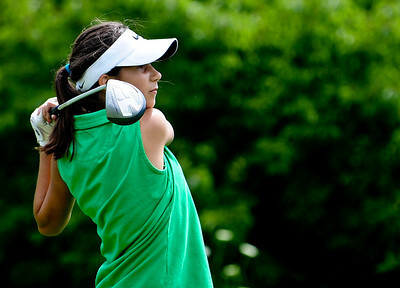 Josh Peckler - Jpeckler@shawmedia.com Amalia Emma of Cary chips her ball onto the green during the McHenry County Junior Golf Association's Billy Vahldieck McHenry County Junior Amateur tournament at Boone Creek Golf Club in Bull Valley Tuesday, July 10, 2012. 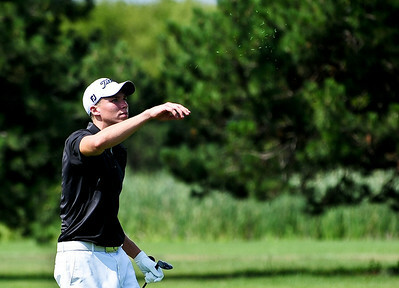 Josh Peckler - Jpeckler@shawmedia.com Anthony Cardelli of Algonquin throws grass in the air to check wind direction during the McHenry County Junior Golf Association's Billy Vahldieck McHenry County Junior Amateur tournament at Boone Creek Golf Club in Bull Valley Tuesday, July 10, 2012. 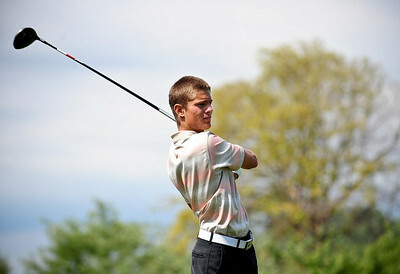 Josh Peckler - Jpeckler@shawmedia.com Austin Wiggerman of Lake in the Hills tees off from the 4th hole during the McHenry County Junior Golf Association's Billy Vahldieck McHenry County Junior Amateur tournament at Boone Creek Golf Club in Bull Valley Tuesday, July 10, 2012. Josh Peckler - Jpeckler@shawmedia.com Jack Mcneill checks the slope of the green prior to putting during the McHenry County Junior Golf Association's Billy Vahldieck McHenry County Junior Amateur tournament at Boone Creek Golf Club in Bull Valley Tuesday, July 10, 2012. Josh Peckler - Jpeckler@shawmedia.com Danielle Roulo of Crystal Lake makes a disappointing face after making a bad shot during the McHenry County Junior Golf Association's Billy Vahldieck McHenry County Junior Amateur tournament at Boone Creek Golf Club in Bull Valley Tuesday, July 10, 2012. Josh Peckler - Jpeckler@shawmedia.com Larisa Luloff of Cary checks the slope of the green before putting on the 10th hole during the McHenry County Junior Golf Association's Billy Vahldieck McHenry County Junior Amateur tournament at Boone Creek Golf Club in Bull Valley Tuesday, July 10, 2012. 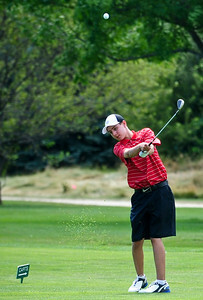 Josh Peckler - Jpeckler@shawmedia.com Brad Spoeth of Huntley drops his club while teeing off from the 11th hole during the McHenry County Junior Golf Association's Billy Vahldieck McHenry County Junior Amateur tournament at Boone Creek Golf Club in Bull Valley Tuesday, July 10, 2012. Danielle Roulo of Crystal Lake makes a disappointing face after making a bad shot during the McHenry County Junior Golf Association's Billy Vahldieck McHenry County Junior Amateur tournament at Boone Creek Golf Club in Bull Valley Tuesday, July 10, 2012.